Product prices and availability are accurate as of 2019-03-23 10:55:03 EDT and are subject to change. Any price and availability information displayed on http://www.amazon.com/ at the time of purchase will apply to the purchase of this product. The winter ear warmers stays on your head well, doesn't slip around, and not tight fitting, lightweight but durable. 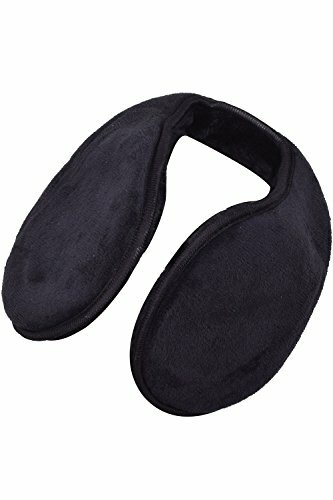 One size fits most, this ski ear warmers that will fit perfectly with large and small heads, men and women. These stylish ear warmers can make you more fashionable in the winter, simple and behind-the-head design, doesn't messed up your hair. Excellent quality mens earmuffs, functional and versatile. Suitable for all kinds of clothes, keep you warm on a daily basis, also perfect for winter sports activities. Wear the warm ear muffs to do any outdoor activities in winter, skiing, snowboarding, jogging or hiking, it will definitely keeps you warm. Note:Actual item may be a little different from pictures because of light effect. 30 days free exchange and returns offered. Please contact us first if there is any question. We will do our best to meet your request and solve your problem quickly and efficiently! Excellent Quality - This winter ear warmers is made of a soft high quality material, perfect to keep warm, stitching is close-grained to insulate the moisture and the cold wind. 100% polyester, plush texture and soft foam padded. Portable size - One size fits most, not easy to slip off. Simple, lightweight behind-the-head design, the ski ear warmers doesn't messed up your hair, pull when not to place undue exertion. Easy storage in handbag or large pocket Versatile Use - The stylish ear warmers fit comfortably without squeezing your head, suitable for daily life, cycling, skiing, mountain climbing, hiking, camping and other outdoor sports. The mens earmuffs has well-made plush lining, to stay warm is very good, perfect prevention of cold wind without blocking sound. Perfect Gift - Good portability, and durability. The warm ear muffs that keeps you warm and gives you stylish looking in winter. It is a winter necessity, suitable for different ages, and is a very fashion and warm gift for family and friends. 100% Satisfaction Guaranteed - 30 days free exchange and returns. Please contact us first if there is any question. We will do our best to meet your request and solve your problem quickly and efficiently!